I’m not even sure where to begin with this whole fiasco, so lets go with chronological order. We’re on BT Infinity, BT Infinity option 2 to be precise. That’s 76Mb down, 19Mb up, unlimited usage, evening and weekend calls, etc. Sounds good, right? Unfortunately we’ve had nothing but trouble with BT since day one, which was just over a year ago. I’ve had to report numerous issues in that time, including not getting all the features I was paying for and even speeds reminiscent of an old dial-up connection on a fairly regular basis. We got off to a bad start with BT, and it only got worse from there. It took several months and a whole load of phone calls to finally get all the call features we were paying for. When we finally did manage to get Caller Display etc. activated on our line they started charging us extra for them, that’s despite the features being included in our package. It took a further bucket load of phone calls to customer services to get that rectified. It really doesn’t help when trying to report an issue that BT customer services appear to be buried in a land where English is an exotic, almost unheard of, language. 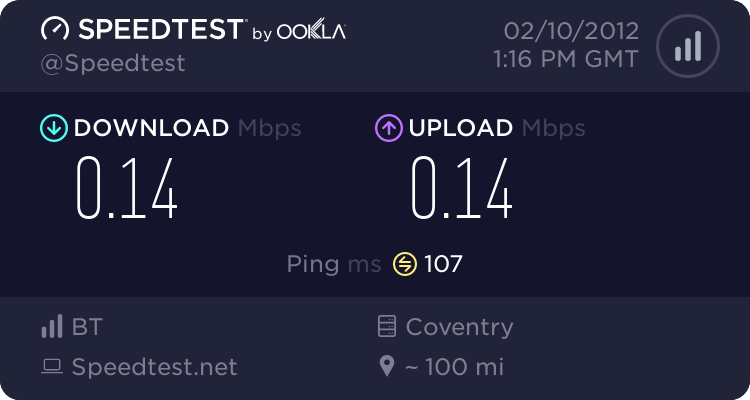 As if that weren’t bad enough throughout our time with BT we’ve suffered regular degradation of service down to dial up level speeds (yes, seriously…on an FTTC connection), which BT never admit is their fault, they always try to blame something at our end. Well that’s not strictly true. Sometimes after bashing my head against that brick wall for a little while, out of frustration I will explain to them what I do for a living. At that point they finally get the idea that the problem is not at our end and they do finally change their tune and admit that there are “problems in the area”. Even then they don’t always confess to there being a problem, no, sometimes it just magically starts working again the next day and they never ever tell you any details about what’s wrong. Eventually I found that going via the @BTCare Twitter team was usually the best bet for getting an answer. Unlike the BT call centre staff the Twitter team seem to know what they’re doing and actually care about customer service. Though the cynic in me says they have to because Twitter is such a public forum, if the Twitter team were as terrible as the call centre staff BT’s reputation would be sunk in no time at all. Yup that’s on a 76Mb Fibre connection, BT Infinity? Perhaps, if they are referring the length of time it takes to download something. So as you can probably tell I was pretty disgruntled with BT anyway, but then (in my first bill of this year) came the final blow. They’d increased their prices! Not by a small amount either, no, now they are demanding £41.90 per month (including line rental), that is not only quite a bit more than I was paying but also more than new customers are asked to pay. That’s especially galling when you contrast what they’re charging us against what the competition are charging: Sky, TalkTalk, PlusNet and Virgin are all cheaper at the time of writing. I called BT as soon as I received the first increased bill (at the beginning of the year) to try and ascertain what was going on. As I had not received any prior notification of impending price increases I assumed there had been some sort of mistake. After answering the usual “security” questions I politely enquired as to why my bill had increased, they went to “investigate” at which point I was cut off. Must be a bad line I thought, so I tried again and the same thing happened. I was starting to think that maybe BT didn’t want to talk to me about why my bill had increased, but I persevered. Eventually I spoke to Eddy, who thankfully didn’t cut me off. Eddy explained that BT had indeed increased some of their prices. I naturally queried whether they should apply to my account given I was in the middle of a contract. Eddy explained that I should have been informed of the price increase if it applied to my account and offered to call me back after he had investigated further. I never heard back from Eddy. Two days passed and I started to get restless, so it was at that point I called upon the @BTCare Twitter team. They instruced me to fill out their online query form, which I promptly did. A further two days passed. Eventually they confirmed that the price increases did indeed apply to my account and pointed me at the following webpage: http://bt.custhelp.com/app/answers/detail/a_id/35832/kw/price%20increase/c/761,2072,2098. I’m not quite sure what on earth could have caused BT to take so long to send me a link to a webpage, but by this point I’d well and truly had enough of BT’s shenanigans so I decided to exercise my right to terminate my contract with BT. Not only had BT increased their prices and not informed me of the increase prior to it appearing on my bill (they are required to notify customers of such changes), but they had also increased the price while I was in the middle of a contract (which I’d only agreed to at the previous cheaper price). I was not happy. I went back through all my emails from BT (I never delete emails) to check that I hadn’t missed any notifications of the price increase, sure enough there were no emails mentioning it and it’s at that point that the fun really began…. I decided to leave BT for greener pastures, which I was perfectly within my rights to do. BT’s own terms and conditions refer to being free to cancel if “material disadvantage” is caused by any changes, which a price increase clearly is. Unfortunately for me that turned out to be a lot easier said than done. I replied to the Twitter team’s email with my request to cancel, another day passed, they informed me I would need to contact the call centre. Given my prior experience with the call centre I asked if there was an email or physical address I could write to so I could keep a written record. They pointed me here: https://bt.custhelp.com/app/contact_email/c/5707 and I promptly filled out and sent off the form. Over a week and many, many, phone calls later I finally got BT to agree to let me go without penalty and extracted a MAC (Migration Authorisation Code) from them. That’s it, I thought. I can now happily and easily move to pastures new. Job done, right? Wrong! After carefully weighing up my options I decided to move to PlusNet, so I signed up on 21st Jan and the switch was scheduled for 31st Jan. That’s when the problems really began, no engineer turned up. I contacted PlusNet to find out what was going on, and spoke to Adam. Adam informed me that “Our suppliers have advised that the visit was missed due to the order being stuck in their systems”. Their “suppliers” of course being BT Wholesale. Great, so that’s a day off work wasted and more money BT have cost us. It then took until 18th Feb, almost three weeks, before PlusNet could twist BT’s arm hard enough to agree to another appointment, which was set as the 22nd Feb. During that time Adam and PlusNet were brilliant. I had regular updates, even when the update was to just let me know there was no change. It sounded like they were really struggling to get BT to do, well, anything. The 21st rolled around, the day before BT were supposed to come, and I received a phone call from Adam. He informed me that BT had cancelled the appointment due to an “exception” with the order. Unfortunately I’d already booked the day off work, so that was another wasted day off. Thanks again BT. Since then I’ve had updates almost every day from Adam, detailing the various trials and tribulations of trying to get BT to send an engineer out for a simple line transfer. BT have even had the cheek to use the existence of a current Fibre connection as a reason for not doing anything. We know BT Wholesale, that’s a BT Retail line. You should know about that as it’s a service transfer, complete with provided MAC, not a new line. That takes us bang up to date, at the time of writing I’ve had three bills with the increased prices and it’s taken several months of trying yet I’m still stuck with BT. Including the cost of the wasted days off work that’s quite a way into three figure cost territory. Sufficed to say I’m really not happy with BT at the moment. PlusNet on the other hand have been brilliant, displaying a level of customer service leagues ahead of BT, keeping me well informed at all stages (something BT could do well to learn from) and I’m not even officially their customer yet. To anyone considering taking up any BT services I strongly recommend you think again and go with one of their many competitors. To anyone currently with BT I suggest the same, the grass is most definitely greener on the other side.